My son is ADHD. So, why did I feel it important to just blurt that out to you? When he was young, he had trouble concentrating on anything for very long. His attention was scattered and he was easily distracted--until we got him some LEGO toys! LEGOs were intriguing and fun enough, that he was able to totally concentrate on them, spending hours on building some intricately designed space station or building. He was so proud to display his accomplishments. And we were proud that he was able to concentrate and sit still long enough to make them. Legos are great for helping children develop hand-eye coordination, and help foster creativity, too. I can't think of any more educational toy. Some college professors seem to think so, too. Many engineering courses now have students building robots, machines, and clocks out of Legos for a grade! For homeschool families, what could be more educational than building the LEGO White House while studying American History or Government? Or building one of the LEGO pirate ships while learning about the trade routes between the Old World and the New World and the dangers involved? Or learning about city government and social studies while building a Lego city? It is much, much more interesting, fun, and educational than coloring pages! Or, with a little help and a video camera, you child might make a great stop-action video like the one below. Check back soon for a post on how to use your computer and a digital camera to make a stop action movie. 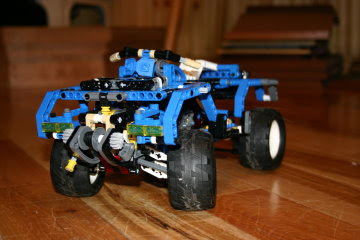 Legos were a part of my homeschool lesson plans during the years my son was growing up. Legos were one of the few things he had that became a family affair. We all loved building with them. His favorites were the space Lego kits, but if the Star Wars and Indiana Jones kits had been available, I know he would have enjoyed them. He designed buildings, machines, and much more during his time in homeschool. Buying used Legos gives you the option of adding blocks to kits you or your favorite Lego lover has without spending as much. Let's face it. Legos, as a premium toy, often come at a premium price. The ability to add to that collection of blocks without selling your house is wonderful. Many budding builders love to make up their own constructions, rather than always building something from a kit. Having a huge bin of extra blocks makes creativity more fun and inviting. Some people online have built working clocks--even a seven foot tall grandfather clock! With Legos, there are only two things that prevent that kind of creativity--time and having enough blocks. Time can be captured in odd moments. Having more blocks is the key. Watch yard sales and online auction sites like eBay for good deals. Have you used Legos in your homeschool?